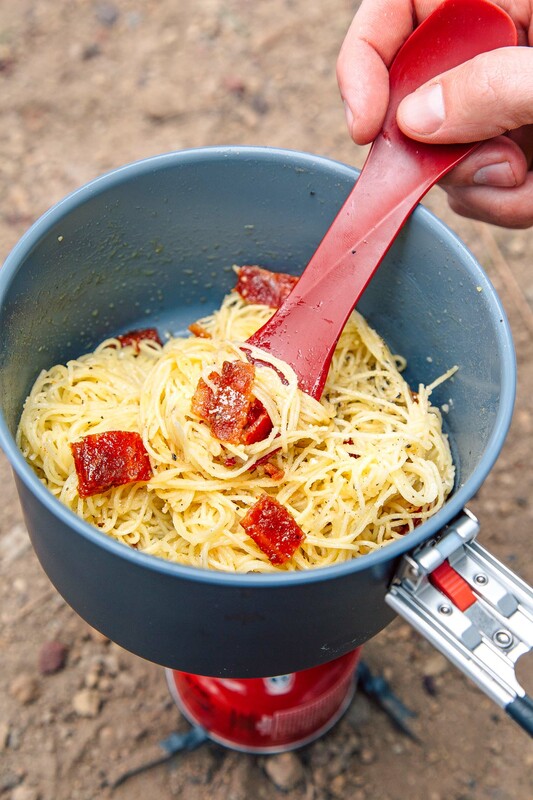 A creamy pasta dish topped with crunchy bacon jerky, pasta carbonara is a quick and easy one pot meal to make on your next backpacking trip. Like the origin story for many popular recipes, the history of pasta carbonara is filled with uncertainty and speculation. Since the name is derived from carbonaro, which is the Italian word for “charcoal burner”, some believe the dish was first made as a hearty meal for Italian charcoal workers. These miners would spend weeks at a time working up in the mountains and needed a meal that would be relatively non-perishable and be completely filling. Back then, a slab of salted meat, a hunk of Parmesan, some peppercorn, and a bunch of eggs (or perhaps a few chickens) was as close to today’s backpacking food as any self-respecting Italian was willing to get. And we can hardly blame them! So, we decided to do our own take on this hearty Italian mountain man meal, but bring it into the 21st century (because we seriously doubt you can take a chicken with you on the JMT). The first step for us was to swap out traditional spaghetti for angel hair pasta. This thinner pasta reduces the overall cook time, which helps conserves your fuel. Additionally, instead of boiling the pasta in a lot of water and then draining, we just barely covered the pasta with cold water before bringing to a boil. Some of the water evaporates, some of it is absorbed by the pasta, and the little that is left over we use to make the sauce. Easy on your water supply with no straining needed. For the eggs, we opted for OvaEasy powdered eggs. We’ve made this dish before at home and we found that using powdered eggs actually makes the process a whole lot easier than actual eggs. Finally, while we would love to pack along a slab of bacon, pancetta, or another piece of fine Italian charcuterie, we decided to go with the next best thing: Trader Joe’s Sweet & Spicy Bacon Jerky. If you haven’t tried this stuff before, you’re definitely missing out. However, if you tragically live beyond the reaches of TJ, we have been told Hormel’s makes a pretty decent substitute and has a good vegan brand of bacon-eqse bits. When the pasta is firmer than al dente, reduce the heat and mix the cheese, powdered eggs, and peppercorn into the starchy pasta water. This creates a rich, creamy sauce. Then crumble in your bacon jerky and dig in. You don’t need a lot of ingredients or even a lot of time to make this delicious pasta dish. Depending on how long it takes your water to boil, this meal can be made in under 10 minutes! 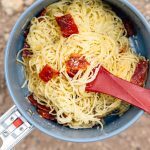 So for your next backpacking adventure, give this recipe a try and enjoy some Italian al fresco dining out in the wild. AT HOME: Place the pasta and salt in a resealable baggie, the olive oil into a resealable container (or pack olive oil packets), and place the eggs, cheese, and pepper into a separate resealable baggie. Pack along the bacon jerky (repackage as needed). 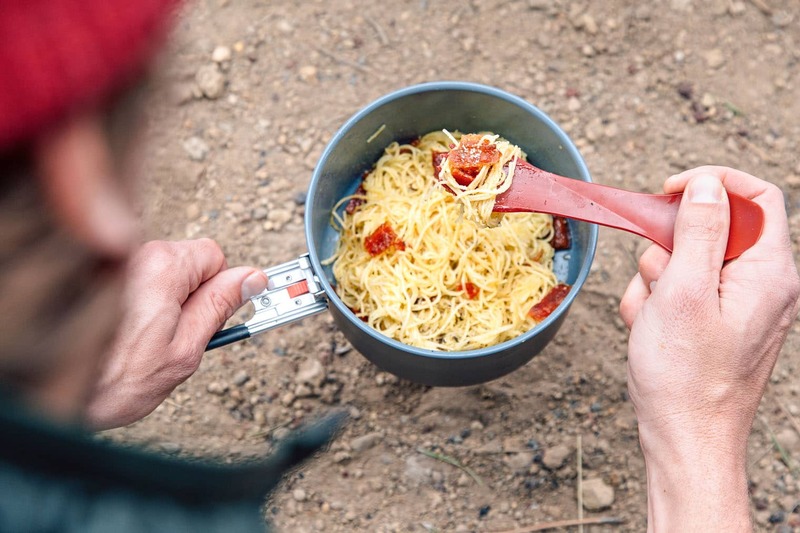 IN THE BACKCOUNTRY: Put the pasta & salt into your cookpot and pour in just enough water to cover the pasta. Add the olive oil. Bring to a low boil and cook until the pasta is just al dente. Turn down the heat and add the egg and cheese and stir to combine (you can add a little water if too much has boiled off - you want to create a creamy sauce here). Remove from the heat, add the bacon jerky, and enjoy! This meal, packed, came in at 8 oz. Per oz nutrition: 101 kcal/oz, 3.8g fat/oz, 11g carb/oz, 4.1g protein/oz. Values are approximate only and may vary based on the specific ingredients you use. I like the simple ingredients. Heading to Joshua Tree next week and will try the Carbonara. Angel Hair pasta does make cooking time shorter. Great taste after a long day. I have use the base recipe and varied the other ingredients. My meals are so much better. THANK YOU. Awesome! Glad to hear you enjoyed it! Definitely a great base to start with for future variations! I really appreciate of you because I got nice information from you.